Order sign stands and frames. Contact Paradise Signs today! Sign stands grab attention on the busy streets so you can lead potential home buyers to your open house! Using sign stands of metal, steel, pvc and plastic stands certainly presents your message well. We provide attractive, quality signs and above all, at a great price. Paradise signs is well known for fulfilling real estate agency orders. Head over to the realtor zone, certain company templates are available. We add your information and optional picture. Please provide a high resolution photo. Smile, your sign experience is Paradise! **Sign Rider can be added to the top of the frame. 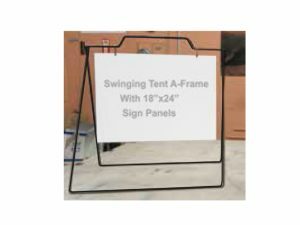 **Metal swinging tent A-frame with 18″ x 24″ double sided sign panel weight is 7 lbs (frame size and panel) stand 30.5″ tall. 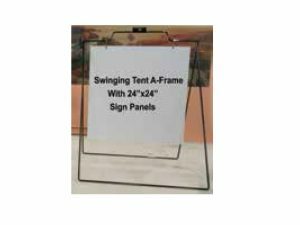 **Metal swinging tent A-frame with 24″ x 24″ double sided sign panel weight is 7.5 lbs (frame size and panel) stand 36″ tall. 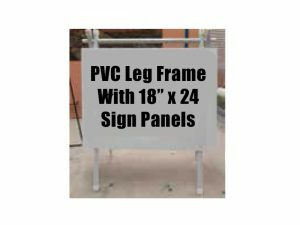 PVC Pipe Leg Frame with 2x 18″ x 24″ sign panels, weight is 5.5lbs (frame and sign panel) stand 28.5″ tall. 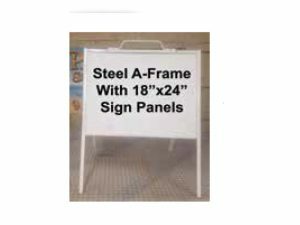 Steel Sandwich Board A-Frame with 2x 18″ x 24″ sign panels, weight is 12.5lbs (frame and sign panel) stand 30.5″ tall. 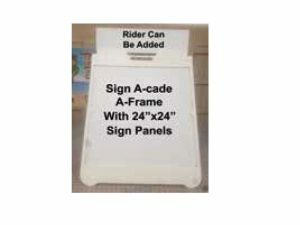 **Sign-A-Cade Plastic A-Frame with 2x 24″ x 24″ 6mm coroplast sign panels, weight is 12lbs (frame and sign panel) stand 30″ tall.